The budget patterns are techniques you use to compare budget information with other data. They are an extension of the handling of different granularities and, as such, use allocation algorithms to display the budget at granularities for which it is not available. Suppose you have sales data at the day and product level, and the budget for each product at the year level, as shown in Figure 1. 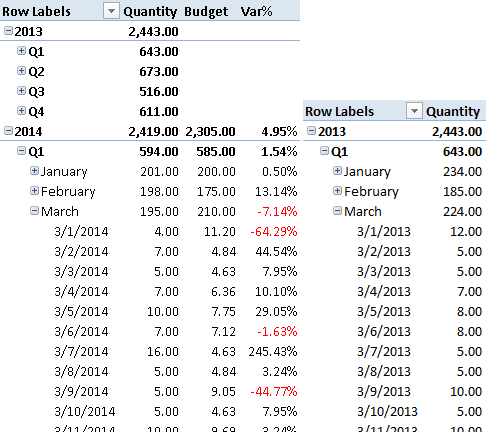 Figure 1 The Sales table (left) has a daily granularity; the Budget table (right) has a yearly granularity. In the data model, both Sales and Budget tables reference the Products table through a relationship, because the product granularity is common to both Sales and Budget. 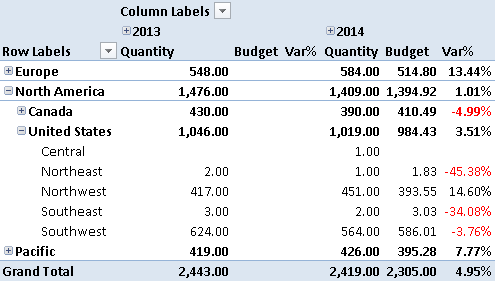 Only the Sales table, however, references the Date table, because the Budget table cannot have a relationship using the Year column. Even if a “logical” relationship exists between Budget and Date at the year level, such a relationship does not exist as a physical one in the data model, as you see in Figure 2. The Date table also contains a WorkingDay flag, which is TRUE only for working days. Figure 2 The Budget table does not have a physical relationship with the Date table. The Total Sales measure is a simple sum of the SalesAmount column in the Sales table. You define the measures related to the budget in the Sales table, hiding the Budget table from the client tools. In this way, you will not have a warning about a missing relationship in the data model while browsing data. Using the DAX function ISFILTERED, you check whether the current filter on Date has the same year granularity of the budget or if it has a higher granularity. When the granularity is different, the measure IsBudgetValid returns FALSE, and you need to allocate the budget on months or days. The Budget measure returns the sum of BudgetAmount if the budget granularity is compatible with the budget definition. 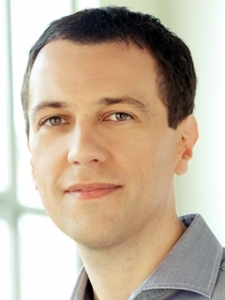 If the granularity is different, then you must compute the budget using an allocation algorithm, which depends on business requirements. In this example, you allocate the same budget for each working day in the year. For each year, you calculate the ratio between the working days in the current filter and the total working days in the year. The SUMX function iterates over the years selected, and for each year retrieves the corresponding budget using a FILTER that simulates the relationship at the year granularity. 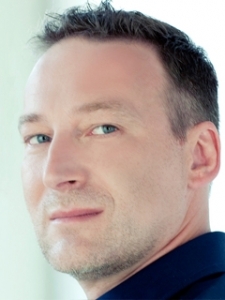 The variance between Total Sales and Budget is a trivial measure. Using DIVIDE, you avoid the division by zero error in case the budget is not available. You can see the results of the Total Sales, Budget, and Var% measures in Figure 3. You split the budget by month according to the number of working days in each month. Figure 3 The yearly advertising budget has been distributed by month. You use this technique whenever you want to allocate a budget to a different granularity. If more tables are involved in the allocation, you will need to use a more complex pattern, as you will see in the Complete Pattern section. 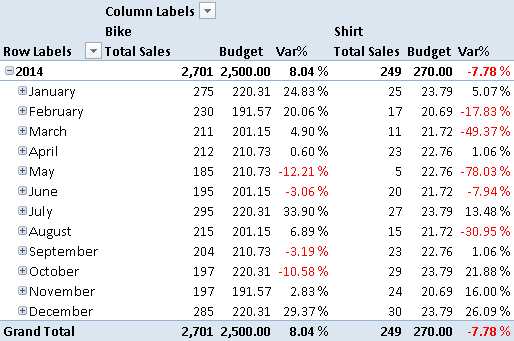 You can use the budget patterns whenever you have a table with data of one granularity and you want to allocate numbers to a different granularity, based on an allocation algorithm that meets your business requirements. If you want to evenly split a yearly budget into a monthly budget, you use a fixed allocation. For example, you divide the year value by 12 in order to obtain the monthly value, or you divide the year value by 365 (or 366 for leap years) and then multiply the result by the number of days in each month. In either case, you have an allocation that is deterministic and depends only on the calendar. You might want to use historical data to allocate the budget over attributes that are not available as levels of the budget. For example, if you have a budget defined by product category, you can allocate the budget by product according to the ratio of sales between each product and the corresponding product category for the previous year. You can allocate the budget for multiple attributes at the same time—for example, also for the date, to obtain a seasonal allocation based on previous sales. The Budget table and the measure it is being compared to may define data at different granularity levels. For example, the budget shown in Figure 4 is defined by product category and month/year, whereas the sales quantity is available by day, product, and territory. The budget does not include the territory at all. Figure 4 The Budget table has a granularity of product category and month/year. 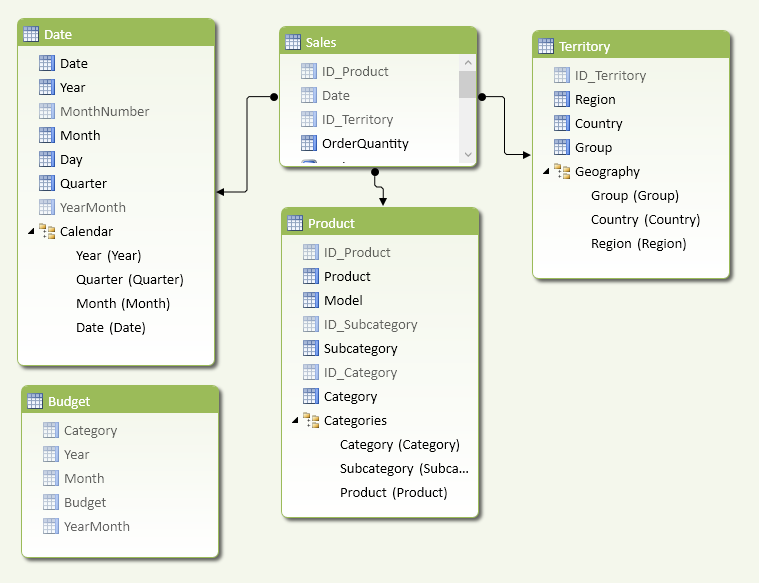 The data model contains a Sales table with relationships to Date, Territory, and Product tables. As you see in Figure 5, the Budget table does not have any physical relationships, even though it has a logical relationship with Date (at the Month level) and Product (at the Category level). Figure 5 The Budget table does not have relationships with other tables. 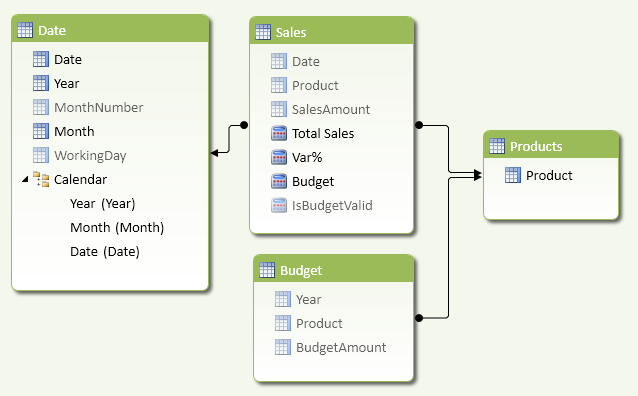 You need a single column in the Budget table for each logical relationship it has in the data model. For example, you need a single column to simplify calculation of the logical relationship between the Budget and Date tables. If you define a YearMonth calculated column in the Date table using Year and MonthNumber with the following formula, you will have a unique value for each year and month, as shown in Figure 6. Figure 6 The YearMonth column in the Date table defines a logical relationship with the same granularity as the Budget table. If you also define the same YearMonth column in the Budget table with the following formula, you see the result in Figure 7. Figure 7 The YearMonth column in the Budget table defines the time granularity of the budget. The Budget measure is calculated differently, depending on the granularity of the existing filter. You only need to apply budget allocation (AllocatedBudget) if the query requests a higher granularity than the one available in the budget definition; otherwise you can use a simpler (and faster) formula (BudgetCalc). You split the Budget calculation using other hidden measures, whereas Quantity and Var% are visible and simpler to define. <fact_table> is the table that contains the data used to calculate the measure that you will compare with the budget. <lookup_granularity_column> is a column in the lookup table that defines a logical relationship between the budget and an entity in the data model. For example, if you define the budget at the month level using two columns (Year and Month), then you use a YearMonth calculated column to define the logical relationship between Date and Budget tables. You have to include a filter argument in the CALCULATE function for each logical relationship you have between Budget and other tables. You implement the IsBudgetValid measure in the example by using YearMonth and Category columns, without specifying any filter argument for the columns in the Territory table, since it is not included in the budget definition. <lookup_granularity_column> is the column that defines the logical relationship in the lookup table (a corresponding column exists in the Budget table). <reference_measure> is the measure used as a reference to calculate the allocation of the budget. <filter_budget_granularity_N> is a set of filter arguments in the CALCULATE function that remove the part of the filter context defining a granularity higher than the one available for the budget. The reference measure might correspond to the actual value that the budget is compared with, but calculated in a different period (e.g., budget sales allocated according to the sales of the previous year), or it could be another measure calculated in the same period (e.g., budget costs allocated according to the revenues of the same period). Each filter argument you pass to the CALCULATE statement in the denominator of the AllocationFactor measure has to remove the parts of the filter context that are not available in the granularity of the budget. For example, if you have the budget by month and product category, you have to remove the filters for day, product name, and product subcategory, so that the remaining filters match the budget granularity. You apply a different technique for each table that has a direct relationship with the table containing data used by the measure. In the data model of this example, the Quantity measure sums the QuantitySold column from the Sales table, so you consider only the tables having a relationship with Sales: Date, Product, and Territory. ALLEXCEPT removes the filters from the columns that have a higher granularity than the one available in the budget, for the tables that have a logical relationship with the budget. Use the ALL / VALUES technique in place of ALLEXCEPT when you need to remove filters from a table marked as a date table. Use the ALL technique for all the tables that do not have a logical relationship with the budget. <table> is the table considered for filter removal; it has a direct relationship with the table containing data used by the measure implementing the allocation algorithm. <lookup_granularity_column> is a column of the table that has a granularity corresponding to the granularity of the budget (e.g., YearMonth in the Date table in the previous example). You keep these columns in the filter context, removing all the other columns of the same table. You apply an ALLEXCEPT or ALL / VALUES template for each lookup granularity column you have in the CROSSJOIN arguments of the AllocatedBudget measure, and you apply the ALL template to all the other tables involved. In this example, you allocate the budget based on the quantity sold in the previous year, which is the QuantityPY reference measure. You remove the filter from all the Product columns except for Category and ID_Category (these columns have the same granularity). You also remove the filters from all the Date columns except for YearMonth, using the ALL / VALUES template instead of ALLEXCEPT because the table is marked as Date table. The special behavior of DAX for Date tables requires a different approach than ALLEXCEPT, which would not produce correct results in this particular case. Finally, you apply the ALL template to the Territory table, which has a relationship with Sales, but is not part of the budget granularity. You test the budget calculation for all the columns involved in allocation. The budget defined by year and month aggregates value at the year and quarter level, whereas it allocates the month value at the day level. For example, the budget in March 2014 allocates by day using the quantity sold in March 2013, as you see in Figure 8. Figure 8 The Budget measure allocates the month value by day using the quantity sold in the same period in the previous year. 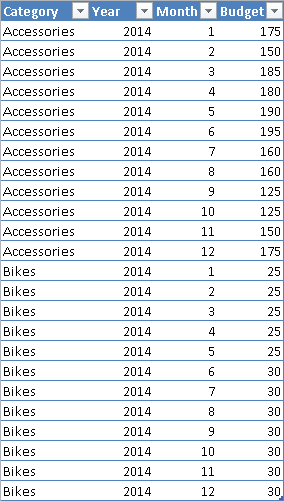 The budget allocation per Subcategory and Product in 2014 uses the quantity sold in 2013, as you see in Figure 9. Figure 9 The Budget measure allocates the category value by subcategory and product using the quantity sold in 2013. The budget allocation per Territory in 2014 uses the quantity sold in 2013, as you see in Figure 10. Figure 10 The Budget measure allocates value by group, country, and region using the quantity sold in 2013.